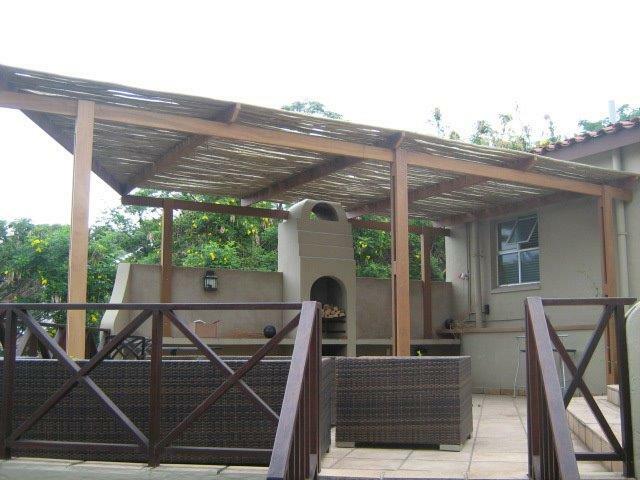 This pergola was built for a client of mine in La Lucia, Durban. They were on of my first clients and have since continued to come back to me for other work ranging from sundecks to doors, bars etc. Their pergola is still in good condition and we have since been back to install corrugated roof sheeting on top to block the rain out but still allow light through. We used a translucent bronze roof sheeting from Safintra. The pergola was drawn by a draftsman and we quoted based on that. With all due respect to engineers, draftsmen and architects, they do tend to over spec when it comes to using balau. Perhaps it is building regulations that force them to spec it the way they do. Balau is twice as dense as SA Pine, twice as heavy and far stronger. I have seen a deck 3.5m in the air being held up with 60 x 60 posts which had been joined with a half check in the middle. Although I wouldn’t build like that, it bears testimony to the strength of balau and its stability. That deck was at least 15 years old and the posts were still straight and had not bowed under the weight of the deck. 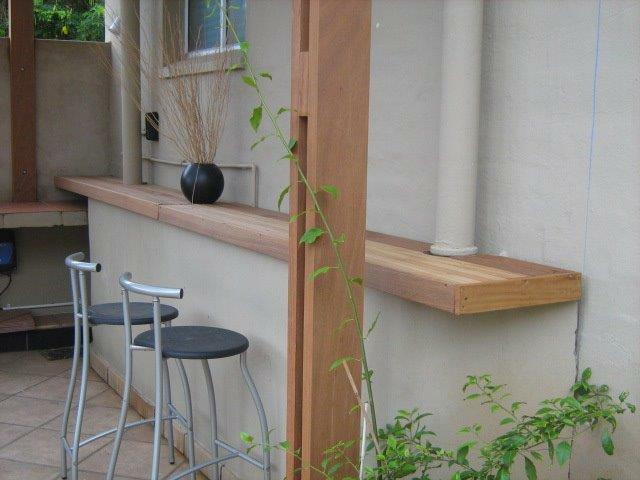 Nevertheless we built according to the spec and used two 40 x 140 pieces of balau as the posts with a spacer in between. So we had a split post which measured a total of 120 x 140 with a gap in between. These were secured to pre fabricated galvanised steel feet that kept the wood of the ground and were secured to the concrete patio using sleeve anchors. From there we built a structure up to the desired height and built it around an existing braai chimney. It was secured to the chimney on both sides to give the effect of the joists or rafters moving through the brick work of the chimney. There was an angled front to it and we fixed a fascia beam to that front edge. The top was clad with thatching laths to give it a rustic look and feel. It kept the sun out and provided the shade they wanted, but the rain obviously still came through. Bolts were used to secure the posts together through the spacers. 2 years later they asked me to come back and place bronze translucent roof sheeting on the top and clad the sides using the same thatching laths. Now it keeps the sun out and the rain but still retains its rustic look and feel. The roof was completed easily enough by attaching some rafters and purlins at the correct spacing and then attaching the roof sheets using self-drilling Tek roofing screws. The front end of the roof sheeting had to be cut as the front edge of the pergola was angled. Cutting plastic roof sheeting can be tricky as it tends to burn and melt with the heat generated from the angle grinder disk. It was therefore better to use a non-abrasive disk like the steel disks normally used to cut concrete or stone. The fiber disk was too abrasive and melted the sheeting wherever it touched it. Please feel free to give us a call for quotes on wooden pergolas, sun decks and other timber related construction by completing this simple form. Or you can get us on 031 – 762 1795. 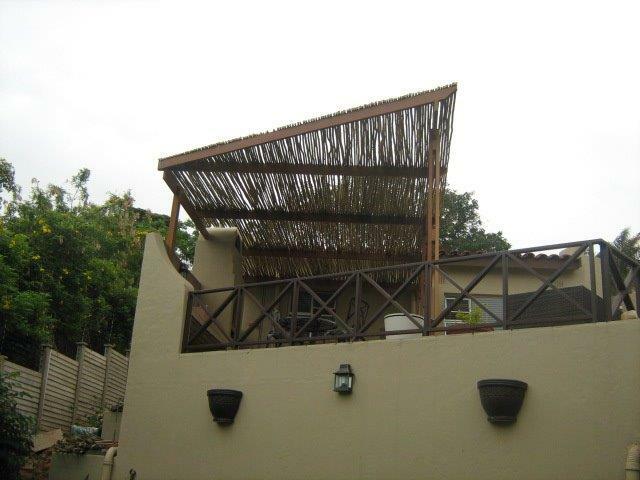 This entry was posted in Pergola and tagged Construction, Construction and Maintenance, Durban, pergola, Roof, roof sheeting, Thatching by Garrick Dunstan. Bookmark the permalink.